Spring is a welcome time of year here in Huron County. From farmers markets to festivals to outdoor activities and more, there is so much to love and enjoy here in Huron County in the spring. Here is a list of events happening in Huron County for April, May, and June 2017. A middle-aged couple and a couple in their twenties are accidentally booked into the same cabin on the same weekend. They decide to share the space and a comedic clash of different generations ensues. Sunday shows start at 2 p.m. Doors Open and Silent Auction begins at 5 pm. Optional Attire: Dress like royalty! Boat check is at 5 a.m. Annual Cheeseburger in Caseville Festival fundraiser, featuring the nearly world famous Not So Silent Auction! Prizes, fun activities like laser tag and tomahawk throwing, food, and fishing! 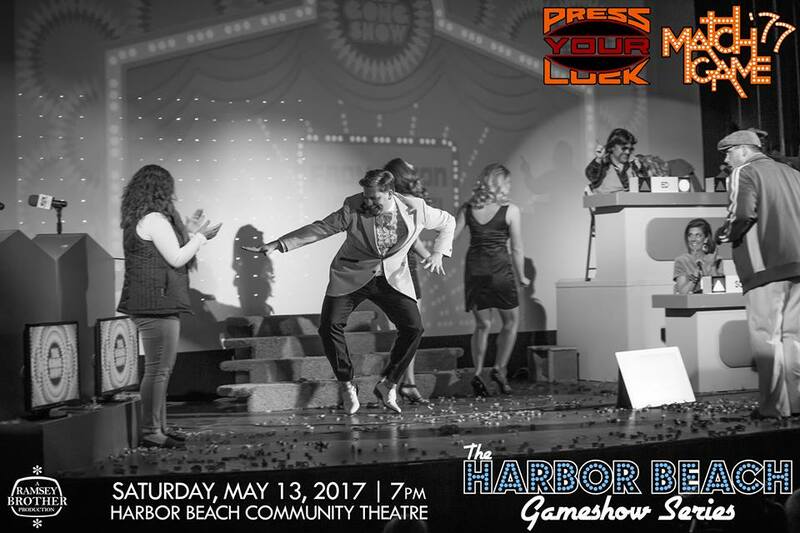 This event will showcase classic game shows like Match Game 77’ and Press Your Luck. Contestants can win multiple prizes, including cash. Don’t Forget Mother’s Day is Sunday, May 14th! Date: Wednesday, May 17th at 7 p.m. Enjoy the many Lady’s Slipper wildflowers in bloom along with arts, crafts, music, and food! Find pottery, wooden bowls, jewelry, paintings, sculptures, stained glass and more! The main events are the crowning of the Sugar Queen Friday night, the Grand Parade on Saturday morning, and the Fireworks show Saturday night. In addition, there are tractor pulls and softball tournaments, among other events. Don’t Forget Father’s Day is Sunday, June 18th! Enter your 4-man team for this fun event! Trophies awarded. Championship team name goes on “the cup”! Food and beverages available – including beer and wine. To register, call the Port Austin Chamber of Commerce at (989) 738-7600. Annual event sponsored by Riverside Kayak Connection, with assistance from Port Austin Chamber of Commerce. 2nd annual event – music around town – on porches or in yards! Right now there are over 30 musical acts and 20 porches as venues! Great fun! Check out this list of fitness centers, dance studios, and yoga and pilates studios in Huron County. Whether your kids are on summer break or you’re on vacation there are a number of fun events and activities for them to enjoy in Huron County. Check it out! From anglers looking to reel in a catch of a lifetime to families just looking for some fun on the water, the opportunities for fishing in the thumb are endless. New year, new you? We've put together a list to help you enrich your mind, body, and soul right here in Huron County. Do you know about Civic Organizations in Huron County? When we come together for a cause, so much good can be accomplished in and around the thumb. School provides our kids with an excellent environment to learn and grow, but young minds can also benefit from opportunities outside of school. In the upper Thumb region of Michigan we have great opportunities to blend into nature. With early spring around the corner, swan and geese migration begins throughout the area. Everyone deserves to have fun every now and then- including us adults! Warning: this list may help you unwind and enjoy yourself! Keep reading for a good time! Geocaching has been called the world’s largest treasure hunt. Join us as we learn more about geocaching and discover some geocaches around Huron County. Whether you’re a couple or just a couple of friends, make it a date in Huron County! Whether you prefer indoor or outdoor activities, there is something on this list for everyone to enjoy. Beer & Wine Enthusiasts visit some of Huron County's jewels. Fall is here so bring on the fun! Huron County has much to offer for Fall activities and events. Check them out, read more! When it's dark enough, you can see the stars. Huron County offers the perfect place for stargazing without light pollution! Winter Activities in the Thumb! Looking out the window right now, the first thought isn't where to enjoy the winter, it's where is the winter? 2016 has shaped up thus far to be a mild winter, though there is still ample time for plenty of flakes to fly.